Phantasy Star Portable(DEMO) - A bug that have a possiblity 'ROAD TO EXPLOIT' was found? 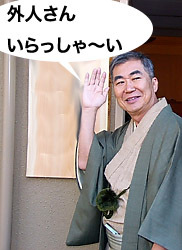 He is a famous japanese comedian and says "Welcome,from abroad"
Read a translated sentence with red letters. I found something crash in Phantasy Star Portable(DEMO) ,it's Free for everyone to get,with modified savedata.But I cannot confirm it's real or not,means to be an exploit or random carsh. With using my modified savedata causing buffer over-flow ,PSP-3000 with OFW crashed and turned it's power off automatically. Of course I NEVER confirm to get a chance to Kernel Mode Access for PSP-3000. Articles - Gripshift(JP) Vulnerabilities is there? All you have to prepare is above only.NEED NO UMD! Anyone can enjoy expectation to hack ,maybe. If your PSP-3000 is crashed , I mean my savedata is really working in your PSP ,comment to this forum please. Download savedata as follows ,unpack the zip file you can see a folder 'ULJM91014' and copy it to your memorystick MSROOT\PSP\SAVEDATA . There is a Movie on YouTube! PSP-3000 with OFW4.20… System software 5.03 containing stability for Gripshift Savedata is not tested by myself. But available in OFW5.03 I heared . I am not a dev for PSP, so I DO NOTHING ANYMORE. I want further progress for hacking,please help me. Until now, Mamosuke gave me some advice on his blog as fallows:only japanese sorry. Either you have something consistant， either you don't. If you want to investigate this game for exploits and share your result with us you are welcome to， but posting a youtube video showing some random crash is not gonna do it. IMPORTANT! Why did I post this topic. I do not know whether this crash seems to make a history of PSP-hacking scene in near futuer.Now we can do is to buy an expensive Gripshift and wait for another few month(or a year?). Do you want a UMDgame that need to hack your PSP? Of course YES. Do you want or can you get too expensive UMD like Gripshift? Of course NO!!! DEMO version is free to get,you can download anytime,anywhere for free.I think this is a good suggestion,dont you? Most important thing I want is the fact to know the crash I found on Phantasy Star Portable(DEMO) is available for PSP-hacking.For all ,can you help to investigate this crash is really available or not for hacking? This blog is "Hacking Lecture about GAME CONSOLE for LADIES and GENTLEMEN -DS PSP Wii PS3 Xbox-Mamosuke Blog" and I am Mamosuke,admin of this blog. so you can make a savedata by yourself and enjoy it! Oh,one that I have to say an important fact...Phantasy Star Portable(DEMO) is a Japanese Version.